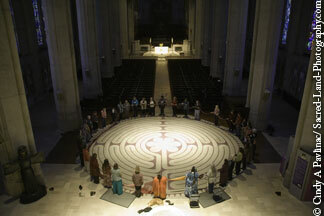 A women's overnight experience in San Francisco's Grace Cathedral. The format of the Dream Quest is quite simple. We gather as a group -- usually about 70 women. We learn several beautiful chants that we will use throughout the experience. We spend time greeting each other and preparing to enter the sacred space of the Quest. 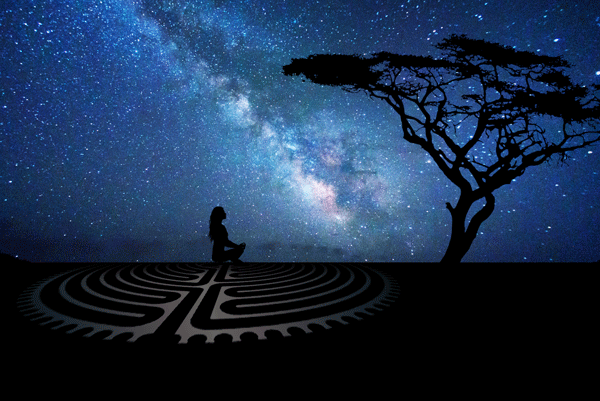 We then move to the Labyrinth and do a ceremony with song, movement and guided meditation that sets the tone and creates a safe and expansive environment for each woman to have her "dream" as well as a warm and nurturing environment for us all to experience a community of heart. In the morning, the women are awakened with a song, and spend the first morning hour in meditation, body prayer, (movement, Yoga stretches etc. ), or journaling. They then meet in the small groups again. A final large group ceremony is held on the Labyrinth and the process of taking what we've learned back into the world is begun. We meet in the same small groups over breakfast and prepare a skit to communicate the message each group wants to share. After the performance, each woman receives a gift and we dance and sing a final closing. Join us at the moment of the year when the veils are thin and the ancestors near as we contemplate the Great Mystery at the heart of all the spiritual traditions. We will form the sacred circle, dance through the veils, walk the labyrinth, and deepen our dreaming of the Mystery. Come, wake up with us in Grace! Serves as a Qualifying Workshop for Facilitator Training.